For control of train operation when it is moving within the block section a instrument referred as Block Instrument is used. This instrument ensures electrically that when a train leaves a station and enters the track section between two sections no other train is allowed to enter this area of the track. This portion of the track is known as block section and the method of this signaling is known as Block Signaling. The control of train operation is exercised by two signals one placed at the exit of a station and is the most vital signal for ensuring safety for train opeeration within the block section and the other is the Home signal which ensures the exit of a train from the clock section. 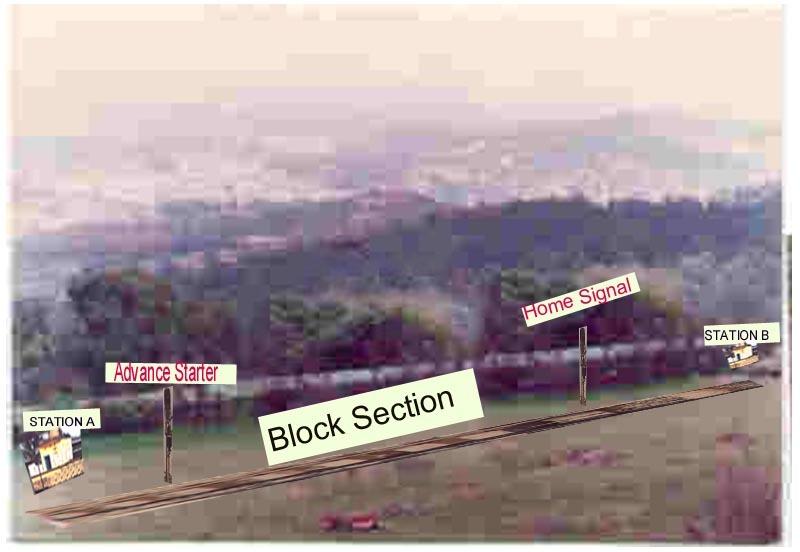 The Home signal is vital because in the block section the train is running at high speed without any expected obstruction or any deviation of the track In the Station the train may be required to negotiate change of track and for this purpose change of speed . In addition in the Station shunting and other trains may be waiting and so clear path may not be available. To protect the train coming in the station or trains waiting at the station the Home Signal plays a vita role and separates the train in the block section from the possible unsafe conditions inside the station.